If I wanted to find out if I could reverse the progressive development of type 2 diabetes with energy restriction, I would conduct a clinical trial. I would need a group that reduced their energy intake, but if I wanted to make sure an effect wasn’t caused by the reduction in a specific macronutrient (and if I had the recourses) I would need more groups; one who reduced fat intake while keeping calories stable, one reduced proteins and one who reduced carbohydrates. I still couldn’t be sure if an effect was due to a specific macronutrient – it could just as well be because of the relationship between nutrients – but I would be more sure. Now, recourses are usually sparse but a study could be done with only one group also. I would just have to make very sure to write in the discussion that an effect could be due to the specific lowering of one nutrient as opposed to lowering of total calories. To test the hypothesis, eleven people with type 2 diabetes ( mean BMI 33.6, nine male and two female) were studied before and after 1, 4 and 8 weeks of a 600 kcal)/day diet. said Gordon, the retired lorry driver. This was actually a study that looked at beta cell function, and it came to be because one of the authors had read about the miraculous healing of T2D that occurs with bariatric surgery. Which means the pathology of T2D is not caused by overweight itself, because the normalization of glucose is vital in losing the T2D diagnosis. The experimental diet was a liquid diet formula (46.4% carbohydrate, 32.5% protein and 20.1% fat, 510 kcal/day) sponsored by Nestlé Nutrition. This was supplemented with three portions of non-starchy vegetables so that total energy intake was about 600 kcal/day. I won’t dwell on the details; it’s an open access article so anyone can read. 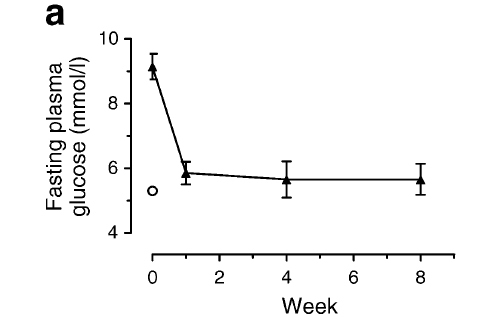 Anyway, the diet caused a significant reduction in plasma glucose (9.2 to 5.9 mmol/l) and insulin (151 to 73 pmol/l after 1 week and to 65 pmol/l by 8 weeks. These remarkable changes happened after just one week, before much fat was lost (2,4kg), confirming that T2D is not caused by overweight. They may be right, in that fatty acids all over the place are to blame, but I still don’t see the need for starvation. What about just reducing carbs? It has been done before, and it has also been found to cure diabetes, despite ad libitum eating. No need for starvation. The discussion chapter includes the necessary limitations section, where the authors are supposed to say something about the role the different macronutrients has on the pathology discussed and whether the effects can be attributed to the reduction in one of these. But there is no such discussion. Starvation cures diabetes. In other words; diabetes is caused by eating to damn much. Because eating less cures it. Lim EL, Hollingsworth KG, Aribisala BS, Chen MJ, Mathers JC, Taylor R: Reversal of type 2 diabetes: normalisation of beta cell function in association with decreased pancreas and liver triacylglycerol. Diabetologia 2011. I look in at diabetic forums from time to time to get ideas for keeping my blood sugar low. These forums are huge. Not only do these diabetics ignore their doctor's advice, they laugh at it. They only use their doctors as tools to get their meds. The diabetics on these forums who keep their carbs low and watch their diets are having amazing success. Most of the type II diabetics no longer need their meds and type I diabetics have dramatically reduced their insulin usage. The diabetic medical industry seems to have a goal of making their patients as sick as possible. The only solution to the problem is not participate in their insanity. I know Jake. People do get great results from sane dietary change. I really don't like the state of diabetic medicine, but I do think it is getting better. This is a rather belated response but I just now found this blog-excellent BTW. I can only chuckle and nod my assent at that statement.